Summer is in full swing and the kids are already getting bored out of their minds! There are tons of things to keep your children busy this summer but it’s really hard for them to come up with ideas on their own. I have created a very cute bucket list printable that should help make getting through the summer a little easier for you. There are many different places for you to put your summer bucket list to keep it handy for your kids to use. The front of the fridge is a prime spot and will keep it in your child’s mind and make it easy for them to mark off as they complete each item. Another idea is to put it in an 8×10 frame and use dry erase marker on the glass to mark off each item as completed. To help get your child motivated on doing the items on their bucket list you can set up a star or sticker system. Have a calendar next to the bucket list and every time that an activity is complete they can get a star. Once they have 10 stars they can get a special treat from mom and dad. We try to refrain from using food as treats in our house and use things like coloring books, new hair pretties, bouncy balls or art supplies as gifts for completing tasks. The kids have 2 circled to do later today and it will work out well because it is HOT HOT HOT here. So we are pulling out the kiddie pool and sprinkler for today’s activities! What do you have on your bucket list this year? We are always looking for fun activities to put on our bucket list. Please feel free to leave your ideas in the comments below so we can all benefit and have fun with our kids this summer. That is a great idea. I keep my bucket list on my phone so I can access it easily. I could cross a bunch of things off for us! This is a great list to remind us to get outside and enjoy it while we can! Love how simple and doable these are! We’ve caught lightning bugs and gone swimming so far. Thank you for this! It is really great my kids would love this i keep meaning to write one for them. What a super cute idea for summer fun! I need to make my own summer bucket list. Thank you for sharing! What a great printable! Good ideas too. Great summer bucket list! I’ve done some of these already, but I think I’m going to try to unplug for a day next. Camping, a zoo trip and a beach trip are all on our bucket list this year. We’ve done two of those three, and several other things. It’s going to be a great summer! awesome idea. although my kids have a zillion ideas already i’m not sure i want them to see OTHER options! LOL! We have a bucket list too! We’ve already done a few things on it – go to a baseball game, see a drive in movie, go on a hike – we only have 97 more things to do by Sept 1! 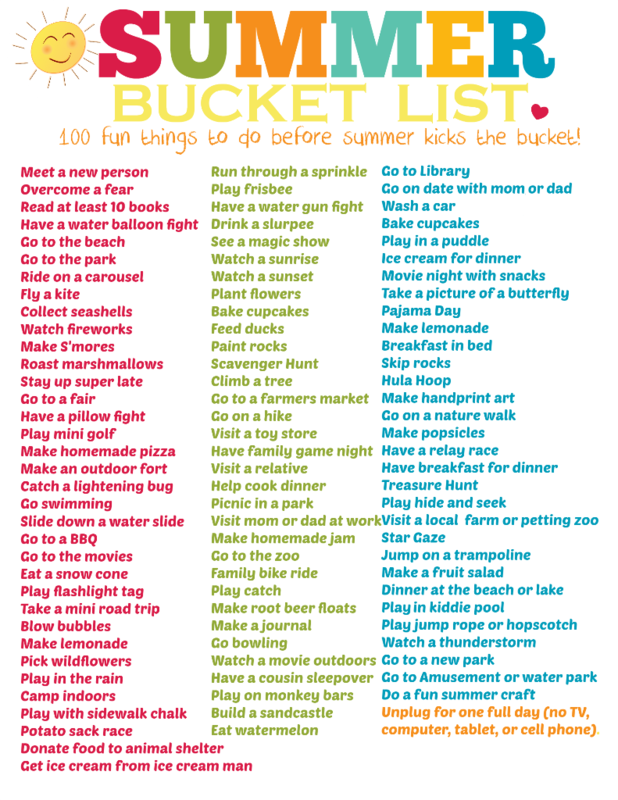 Love love love the idea of a summer bucket list. It makes those “well, what can we do today” days go away! Always something fun to do with a summer bucket list! Thank you for the extensive list in printable format. I like the idea of a treasure hunt. I bet my little one would love it! This is awesome! There are so many on here that we do whenever we can but it is nice to have the reminder that there are more things we could be doing! This is an awesome list. Lots of good ideas. Now that is a bucket list. I have printed a copy of it to add to some of the ideas I have come up with. I notice your list does not include spending more time in front of the TV, or IPad. Kids need to be introduced to the fun of using their imagination and getting to know their world around them. Wow! This would keep us busy for sure! Great ideas to add to our summer bucket list! Thank you for the printable. This is great and so doable for kids! Holy mackerel! There’s a lot of great ideas for summer activities on that list! I love this list! We should make a bucket list as a family, and when the kids complain of being bored I can send them to check it out. I love how bright and cheery yours is; it could totally be displayed in a frame like you suggested! We could cross off a lot of these! We’ve been unplugged for a while between no internet service and moving, so we should get some bonus points. That looks like a fun bucket list. We unplugged for a full day and it was so liberating. What a cute idea! I’m going to print this for when our daughter gets older! This is a great bucket list! Love that it’s a perfect printable too! What a fun list! I am sure that my kids would totally go for the ice cream for dinner first lol. We’ve actually done quite a few on here. I love having a list to cross things off though. This is great! What a great idea to have bucket list printables for the kids. My oldest two would love these. I think my youngest would love a bucket list printable. She likes lists and planning. Wow this is fantastic. Summer can sometimes be long and hard to find things to do every day so this will be super handy! I love this list! I am printing a copy for my kiddos this summer! 100 days of fun WITHOUT more time in front of the “plugged in” stuff. I really think this is a great idea. I am going to do this for my kids as well. We just made root beer floats with my son tonight. It was the first time he had them! on what it influences the surroundings and wellbeing. The internet is tormented with websites that guarantee anything underneath the sunshine, but several would be the sites that really produce.